It was a lovely end to a very long and busy Spring Term. At our Full Local Governing Board meeting we said a huge thank you and au revoir to Claire Brown as she stepped down as our Chair of Governors and a LGB member to enable her to fulfil her role as a Trustee of Odyssey Collaborative Trust. The Year 3s performed brilliantly in front of the school and their families on Thursday. Well done all of you for your hard work and effort. I really enjoyed the singing and jokes that were part of the Egyptian Mummy Mystery. Year 3 and Year 6 enjoyed an incredible Languages morning run by students from Derby University. There were games, songs and a wide variety of languages for the children to experience. Very fittingly the SPRING Party won the Points Challenge this term with 5,478 points! 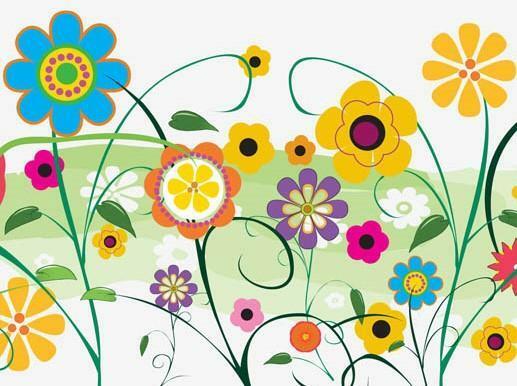 Due to a very busy 4 weeks after the Easter break we will have a non-uniform day and treat for Spring Party on TUESDAY 7th May. After the holidays our whole school topic for the summer term will be about the world the children live in and how to protect this for the future. To launch the topic we will be having an enrichment week travelling across the world. On FRIDAY 3rd MAY the children can come to school dressed in colours of a country of their choice or national dress for a country of their choice so that we can have a One World Day. We wish everyone a very Happy Easter and a peaceful break. School reopens on Monday 29th April at 8:45am. The week started with Year 4s transforming themselves into Ancient Greeks and had a fabulous day of history, culture and food. It was a great learning experience for all the children. The Eco Council, Gardening Club and classes planted the remaining trees to create a Silver Birch Spiral, shaded areas and we have sent some trees to the Infants to plant in their garden area. So, well done to everyone for joining in on this phase of our Cynefin Project. Despite clearly visible signage and repeated reminders to parents and children we still have children and young people using the equipment at the end of the school day. Unfortunately, we now have no choice but to allocate school budget to provide fencing to mitigate the Health and Safety Risk. This is greatly frustrating. As I am sure you are aware, this is a time of increasingly tight budgets and we are now having to spend funds on such things that ordinarily are not required during the school day. Having spoken to both parents and children it is clear that many are equally as disappointed that others are not 'following the rules'. At the end of the school day we hope to clear the school site in a safe and orderly fashion and unfortunately this is not helped with children having 'unsupervised playtime' on the gym equipment. It has been a really family focussed week at Portway. It was lovely to see so many families at our Parent consultation evenings. The feedback has been very positive from parents, children and staff. The Governors visited this week to see how we support the well being of children, families and staff in school. They spoke to our Peer Mentors, Hub members, Party Leaders and pupils and staff over a very pleasant lunch. They were super impressed with the work happening in school to support well being and develop those life skills of resilience and self regulation. As always the children were able to talk with great enthusiasm and understanding of what happens in school, why it helps and how they can be involved. The beautiful weather made our Family Tree planting event all the more fun. It was great to have over30 families come to school and plant a tree as part of our tree trail. Thank you to our families for supporting this event and for the lovely comments. 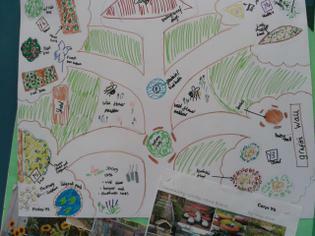 a huge thank you to Year 5 who mapped out our tree trail, great maths and science guys. Also, thank you to all the staff who gave up their Saturday to come along and help. 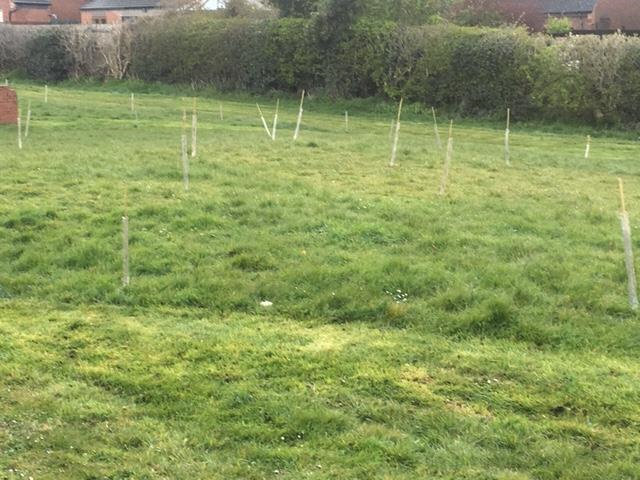 Certificates will be created this week and more trees will be planted by the children during the week to create habitats and food supplies for wildlife and shade for the children in the future. Unfortunately, we have had to cancel our main fundraiser for our outdoor learning project (Cynefin Project) due to having no ticket sales for the Quiz Night. As a school, we feel it is equally important for parents in school to feel included and as part of this we felt a Parent/Teacher/Governor social event would be a great way to get new members of the school community to get together and get to know people in a social context. Also, it was seen as an opportunity to raise money, have some fun and have an evening out. Clearly, we misjudged this. Consequently, we will be sending out a Survey Monkey to parents to see what types of events you would like to see in school recognising the hard work, effort and numbers of helpers are required to run many of the events we have had in the past we would like to try some new ideas and need your suggestions. We are still aiming to raise £2,500 to provide the children with the outdoor learning areas we need to increase our use of the outdoor space we have. We had a fantastically inspirational talk as part of the Big Pedal Challenge. Again, pupils were congratulated on the range of interesting questions they raised and also for their positive behaviour. Everyone looked incredible for World Book Day, thank you to parents for your support of this event we have raised £280 which means we are able to create a second library trolley. The children also created amazing Potato characters, well done. We ended the week with children in Year 4 and Year 5 being taught a range of languages from Swahili to Dutch by students from Derby University. Year 3s worked with the Young Shakespeare company having fabulous workshops on A Midsummer Night's Dream. I also had the privilege of taking a group of children to perform at the Celebration of Dance at the Riverside alongside 12 other schools. The children were quite simply brilliant. These experiences truly enrich the learning happening in Portway Juniors. It is weeks like this that prove just how amazing the staff, pupils and families of Portway Juniors really are. Please remember school is closed next Friday (15th March ) for INSET Day. We will be having a Red Nose Day dress down on Thursday 14th March. As you are aware we have big plans for Portway Junior School grounds. These will benefit the whole community including the Infant School and local clubs. We have called this whole project The CYNEFIN Project and we are using a number of ways to raise money. 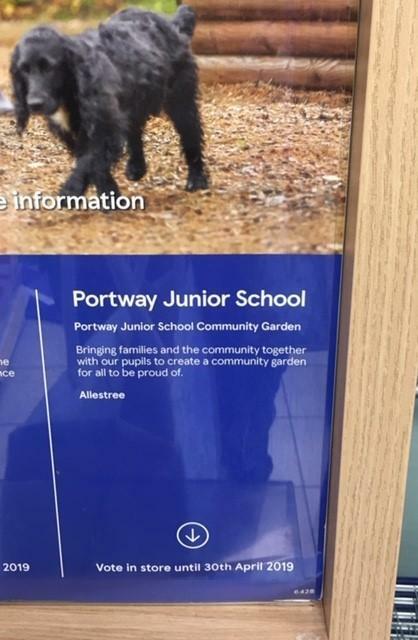 Tesco's Tokens- If you shop in Tesco please ask for your token and place it in the box for Portway Juniors. We hope you will join us and support our fundraising efforts for the benefit of all the pupils at Portway Juniors. The week also began with the fabulous news that Natasha in Year 6 had qualified to show her St Bernard dog at Crufts next year having had a very impressive and successful show during the holiday. So well done and good luck Natasha. The PTFA Neon Disco was a huge success and everyone looked brilliant and behaved really well. Thank you to all the parents and staff who helped organise and run the event. Next week we will be saying farewell to Mrs Hughes who has been completing her second teacher training placement with us and we wish her every success in the future. Good luck also to the pupils taking part in the BBC 10 pieces launch in London on Monday. This is a very prestigious honour and, having seen their performance, I know they will be truly brilliant. We would like to improve our wet playtime/golden time boxes. If you have any old games/jigsaws, construction kits or books that are in good condition and complete that you no longer use please send it into school. ASK A GROWN UP AT HOME before you bring games etc into school. Thank you. This week the Cabinet and House of Commons met and decided that they wanted to look at 'What makes an excellent Team Portway member?' They will be talking with the school community about what this could look like and how to make sure everyone in school feels part of and behaves as a member of Team Portway. A new School Parliament has been set up for ideas and suggestions. The children are enjoying using the new outdoor gym equipment during the school day. Unfortunately, the SLT and staff are still spending a lot of after school time telling children from Portway Juniors, Infants and Woodlands to come off the equipment. We recognise that it is very tempting but again request that parents support the school and do not allow their children to use the equipment at this time. In school we teach the children many essential life skills, coping with temptation is one of those life skills. A warm welcome back and Happy New Year to you all. The children have had a very successful start back to the new term and our new members of staff; Mrs Vickers and Miss Potts have started to get to know everyone. It is also great to have Miss Wilkinson back from her maternity leave. We have had a super busy week with our ECO Award Launch. We are proud of our Eco record but wanted to shine a light on our achievements and develop the children's understanding to enable them to make informed decisions in terms of being responsible individuals. We will continue our Eco journey over the coming months and years. Our outdoor gym is now available for the children to use in their break times. We have spent the week showing them how to use it safely and appropriately. The equipment will be supervised during break times and a timetable is to be trialled over the next couple of weeks. We will then see how this is going. It was an absolute pleasure to spend Friday afternoon with our Party Point winners, Summer. The children enjoyed playing traditional games and having a go on the ActivWall. It was great to see the children mixing and playing games collaboratively. Thank you children for a lovely afternoon. Next week we have our first Cabinet and House of Commons meetings for 2019. I am looking forward to hearing what project the children would like to address next having successfully creating a Break Time Act and improvements last term. Portway Junior School - an Arts Mark school in Allestree, Derby, has put “creativity” at the heart of their curriculum. 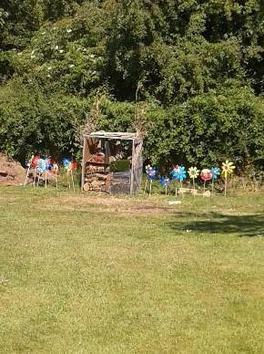 This term the whole school has been involved in a topic based on “Hansel and Gretel”. The idea started a year ago, when the whole school visited Derby Theatre to see their production of “Peter Pan”. They realised they had missed an opportunity, so started planning for the following year to work around “Hansel and Gretel. A year later the children and staff have been involved in a range of exciting learning opportunities and partnered up with arts organisations in Derby. The whole project was launched in October with a two day cultural extravaganza at Derby Theatre and Deda. The children worked with theatre, dance and music (from Sinfonia Viva) practitioners to devise their own production of “Hansel and Gretel”. Through this 90 of the children attained their Discover Arts Award. We have now started thinking about next year's production! On Friday 11th January 2019 the children in Summer Party can have a dress down day and will have a games afternoon. We will be having our new outdoor gym installed next week. Please ensure your children stay off the grassed area at the beginning and end of the day. Many thanks. Teachers at break time trying to solve Dr Dave's Maths Challenge. Who will be the first one? Some of our new books from the PTFA, thank you. Firstly, thank you on behalf of the Royal British Legion, this year we raised £176.63 from your Poppy Appeal Donations. The tech rehearsals have gone incredibly well and the production is looking fabulous. We were incredibly lucky to have a visit from Mike Kenny this week, the writer of Derby Theatre’s Hansel and Gretel. He was completely blown away by the children’s hard work, creativity and enthusiasm. 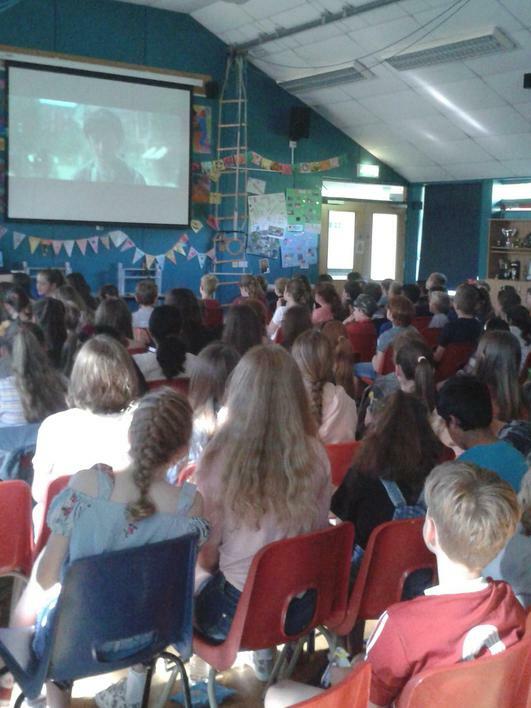 The PTFA film night was well attended and the children (and adults) thoroughly enjoyed it. Thanks to the PTFA for organising it. It was the perfect end to a very Christmassy day. School will be closed on Monday as the staff have an off-site INSET day. Congratulations to the year 5/6 children who performed in the gymnastics competition this week. They have worked extremely hard with before school practices and shown great commitment in preparation for it. Well done Team! The Cabinet have been finalising the Portway Juniors Lunchtime Bill which they will present to the House of commons next week. Next week, school will have a very busy feel with the Theatre visit, PTFA Film night (dress up as an Elf character), Christmas lunch (and winter jumpers day) and Technical rehearsals for our production of Hansel and Gretel. A quick reminder is that children have their coats in school as we are outside at break times even if there are showers. Finally, the trees along the pathway will be decorated this week by the children. If you have any spare red, blue, green or yellow/gold decorations please send them in to school. Many thanks. It has been a very busy week as the rehearsals for Hansel and Gretel really get underway. The children are teaching each other songs, scenes and dances they have devised with Derby Theatre, Deda and Viva Sinfonia. The backdrops, props and costumes are being created and the show is starting to come together. This year we have had to charge a small entrance fee go towards the cost of putting on this unique production. Tickets are selling fast and we are really looking forward to seeing you there. Next week we are off to see Derby Theatre's version of Hansel and Gretel. It was lovely to meet our prospective new parents for September. They had a chance to hear about the exciting things we do at Portway Juniors and were shown around the school by our very knowledgeable Party Leaders. We had a very positive PTFA meeting where it was agreed to spend £600 on maths toolboxes and £400 on non-fiction text for class libraries. Thank you so much. We also discussed lots of new ideas including some events for the grown ups. Please see the PTFA link for the minutes of the meeting. The week started with a most incredible workshop for our Year 6s with the Young Shakespeare company. They were working on Macbeth and everyone really engaged with the language and story. It was lovely to see so many parents and carers at our Parents' Evening. Thank you to Finn and his friends for a really informative assembly on Wednesday for National Diabetic Day. Well done for such a great job. We had a Governor Visit on Thursday afternoon which gave Governors an opportunity to share and celebrate all the great learning that is happening in school. It was fabulous seeing everyone in their pyjamas on Friday for Children in Need. There was an incredible array of very funky slippers as well. World War 1 Centenary Week: It has been a truly memorable week. The children have spent the week thinking about the historical impact of WW1, the human stories and the purpose of remembrance. Many thanks to all the children who made a poppy for our commemorative poppy field. They will be relocated to the community garden after the coming week. The children enjoyed our Diwali celebrations on Wednesday. It was wonderful to see both parents and children at DR DAVE'S MEGA MATHS event. It was great fun with lots of ideas and games with a maths twist. If you were unable to make the event, we hope to host another one in the Spring term, so keep your eyes peeled for the flyers. The week ended with our Remembrance Assembly which included singing by the Lest We Forget choir, readings and poems by the School Parliament members and the reveal of our art installation in the hall. The children observed a minute silence to think about all they had learned during the week. The School Parliament have met this week and are in the process of passing the 'Portway Lunchtime Act' having proposed a Bill they are now in the process of deciding the final wording. The week ended on a surprise note with the opportunity to see a theatre production in school of Pinocchio, which was great fun and gave the children a very different experience of theatre craft. Next week we will be holding our Parents' Evenings in the hall. The BOOKFAIR will be in WARHOL class from 3.30pm - 4pm Mon and Thurs, 3.30pm - 6.30pm Tues and Wed. We look forward to seeing you all there. The children of Portway Remember. Our growing poppy field of commemoration. I am very proud of our Lest We Forget Choir who performed brilliantly at the Genting Arena, Birmingham, on Saturday evening. They represented the school beautifully. Well done! We joined a 2000 strong mass children's choir, Birmingham Schools' Symphony Orchestra, Ealing Youth Orchestra, the debut performance of the National Youth Pipe and Drum Band, Sandwell Youth Brass Band, Birmingham Schools' Guitar Ensemble, Leicestershire Show Choir, plus performers from Wales, Norfolk, Bournemouth and Sutton Coldfield and a Parade of 57 Flags by Scouts and Guides. Congratulations to Year 4 on their brilliant performance of The Tempest. You did a fantastic job and every word could be heard. Super effort. A reminder to parents that coats will be needed in school everyday. we learn outside even when the weather is inclement. Please sign up for Parents' Evening using our online system. What an amazing week. The children have produced some incredible scenes for our Production, through their work with Derby Theatre, Deda and Viva Sinfonia. I was so impressed with what they achieved in such a short space of time and their positive attitudes. Outdoor learning and team building activities have been a great success with the atmosphere in school really buzzing. Congratulations to our Year 6's who had a fabulous week of challenges and successes. Their behaviour and attitude was magnificent. Based on the huge success of the trip, the fabulous responses we have had from staff, parents and children we are now planning next year's residential. A huge thank you to all the staff and helpers who gave up their time to support the children on this valuable experience. 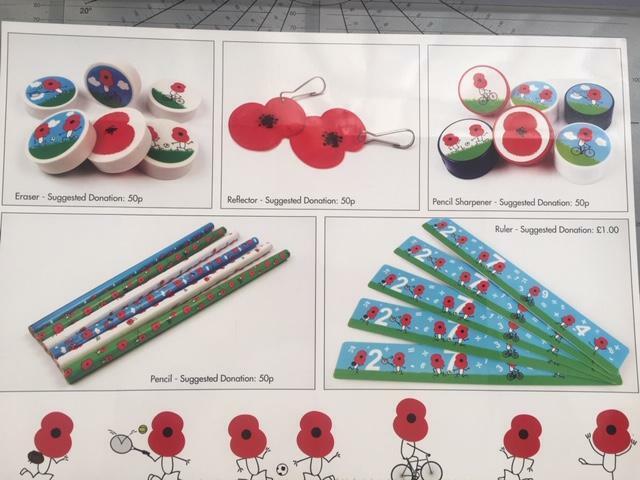 Next week we will be selling Poppy Appeal items as shown below. Parental involvement has been a feature of the last couple of weeks, it was great to have some new faces at our PTFA AGM. We had the opportunity to say thank you to last year's committee for all their hard work especially Karen Mosely who has now stepped down from the committee after many years of dedication. New ideas for fund raising events were discussed and we hope to see more parents at our next meeting on Tuesday 20th November, 6pm at school. It has been lovely to see parents coming along to our coffee and chat sessions with Mrs O'Farrell who has arranged for an interesting range of speakers to join us. They are held on Thursday mornings from 9.15am, please drop in and see what we are doing. The children are looking forward to Team Building Week, when they will get lots of opportunities for collaborative, problem solving and creative thinking projects from maths trails to creating the choreography, songs, props and scenes for our Production in December. As October begins and the leaves start to fall the Autumn term is well under way. Now that everyone has settled in we have talked to the children about remembering the school rules to ensure school continues to be a happy, safe and inclusive place of learning. In the past week the children have had the exciting opportunities to take part in Derby Feste, Rock Steady Workshops and sporting events and everyone involved has represented the school brilliantly. I awarded my first Head Teacher's Award to Freddie in Year 3 for the exceptional and inspirational attitude he demonstrated this week, well done! The Governing board have received notification that our application to become a Multi Academy Trust has been approved by the Regional Schools Commissioner. We will keep you updated on the conversion as the process progresses. It was lovely to see new faces at our PTFA AGM and we hope more parents will join us for our next meeting on Tuesday 20th November, 6pm at school. Reading For Pleasure: We are working hard to promote reading for pleasure in school, here are some great books your child may enjoy. Today we said a fond farewell to Mrs Boden; after supporting children staff and parents at Portway Juniors for many years. We wish her every happiness and success in her future adventures. Well done to the children in Years 4, 5 and 6 who were involved in the Brownlee Mini Triathlon event this week. Hopefully it may have sparked an interest in taking these sports further. Also, congratulations to our Y5/6 Mixed football team who came third in their competition this week. All the children behaved impeccably and demonstrated excellent sportsmanship. So our Prime Minister is Joseph L and our Deputy Prime Minister is Emilia B-B. The children have been reminded that nail varnish, fancy hair accessories and coloured hair are NOT part of our school uniform. Please help us by reminding them about this. As part of our drive to encourage independence we also reminded children, again, to look after their belongings as we have an ever increasing clothes and lunchbox mountain stacking up in the school hall. Good luck to Wright Class who will be leading the Derby Feste Parade tomorrow. It was lovely to see so many of you at the 'Back to School Fair'. The school was certainly buzzing. A HUGE 'THANK YOU' must go to the PTFA for organising the event and everyone who helped with setting up and on stalls. Please remember it is the PTFA AGM in school on Tues 2nd October. Everyone is welcome. We also had the opportunity to meet together as part of our 'Meet the Teacher' evening. As we look forward to this new school year it is great to see Team Portway working together to support all the children in school to achieve their full potential and to have the sort of experiences which help to develop their resilience, positivity and motivation. This week we held hustings for the Party Leader Elections. All the children who put themselves forward were amazing. They spoke with passion, eloquence and confidence. Following the whole school vote our Party Leaders and Deputies were elected and this then prompted a General Election in school. Next week our Party Leaders, MPs and Prime Minister will begin their role leading our School Parliament. Further information will be available on our School Parliament link. Next Saturday (29th September) children from Joseph Wright Class will be leading the Derby Feste Parade which starts the Derby Feste Arts Festival. If you are in town on Saturday please come and cheer us on. The fun begins at 10.45am at The Spot outside the Intu Centre. What a great start to the school year. The children have settle back well into school routines and learning. We have already had 'Rock Steady' in school for an assembly, which was great fun. The new team points are looking great, it's very close at the moment with the Green Team edging ahead slightly. Next week we will have our Party Leader elections for our new School Parliament which will then lead into our whole school vote for class MPs. We will have a School Parliament link on the website for children and parents to access once the elections are complete. We hope to see as many of you as possible at our Back to School Fayre on Friday 21st September. Clubs will be starting over the next two weeks please see our clubs page for details. The last full week of this school year and still the sun is shining. Year 6 started the week with a visit from the police talking about the dangers of knife crime the children were complimented on their interesting and mature viewpoints and their responses to the discussions. The whole school had a 'Staying safe in the holidays' Day which included Fish and Chip lunch in the school grounds. Our moving on assembly was led by Mr Butcher and the Year 6 children received their moving on books. DIAMOND Team enjoyed a Highland Games afternoon as team winners. They were busy caber tossing, welly wanging and 'haggis' hurling and ended the afternoon with Scottish oatcakes, cheese and a soupcon of Irn-Bru. It was lovely to see so many parents in school for the open afternoon and thank you for all the lovely comments given to myself and the staff. We then had the amazing treat that was the Portway Musical Tea Party. The children performed beautifully and it was lovely to hear such a wide range of music and see such amazing talent on display. Well done to all the children and thank you to the music teachers, to Miss Beecroft and Miss Kerwood and especially to Mrs Hindmarch for organising it. The week has ended with our Annual Sports Day. Again the children showed their determination and talents and we are very proud of all of them. Congratulations to RUBY Team who won the overall title this year. A very busy week for everyone, especially the Year 6's who have been involved with their residential trip or outward bounds activities. All the children behaved brilliantly and faced the variety of challenges with great positivity. Thank you to all the staff for their hard work supporting these great experiences. All the children in school had the opportunity to work with the University Science Dept on Wednesday. They brought in a range of wildlife creature (taxidermy) for the children to look at and touch to help them get closer to these beautiful British animals and birds and to explain more about their habitats and protecting the environment. The NSPCC came to school to thank the children for their amazing fundraising efforts with the sponsored walk. We raised over £3,200 for this incredible charity. The Year 4's ended the week with their Greek Day celebrations. Everyone looked terrific and I have to say watching them 'strutting their stuff' in the catwalk show was great fun. Wow! What a week. Scorching weather, transition and performances. The week started with transition which was a lovely opportunity for new parents to Portway to get to know staff in school. We are looking forward to working with all our new and established parents over the next few years. Tuesday was transition day with our Year 6s visiting their new schools, new September intake children and staff visiting us and our current children having the opportunity to get to know their new teachers. It was a lovely day with lots of exciting things happening in school, including a Dino Dig for our newY3s! Year 2 children visited us again to see the Y6 production of The Lion King and the whole school got to seethe dress rehearsals. Yesterday the Y6 parents finally got to see our end of school production. I have posted some photos and comments from parents. The production was a true celebration of all the children in Year 6. Every child had a say in what they did, from make-up to stage and costume design from acting, dancing and singing to technical production with sound and lighting. The children all pulled together to create an incredible production. We are so proud of them, they were all stars!!! I would also like to thank the enthusiasm and commitment of all the staff involved as they helped make this end of year event so very special. And finally, today we were officially awarded our Music Excellence Award. Congratulations everyone. A super hot week for everyone. It started with Year 5 and Year 6 taking part in workshops with the NSPCC and ended with our NSPCC sponsored walk. The Year 3, Year 4 and Year 5 children watched the superb Saltmines production on Internet safety and completed workshops.The PTFA also handed out the Year 6 leavers hoodies. Due to the weather and position of our school field, sports day had to be postponed for safety reasons until Friday 20th July, when we hope the weather will be a little cooler. The children still had their picnic lunch under the trees around the school. We will like to remind parents again that it is essential for children to have a cap/hat and water bottle in school everyday. Next week will be super busy with transition days, Year 6 production and Languages Day. An amazing week of learning with the children accessing a whole range of wider learning experiences to help prepare them for life both inside and outside school. We were visited by First Steps to talk to the whole school about Body image and then they completed workshops with our Year 6 pupils. The NSPCC visited the children for a whole school assembly on 'Speak out, Stay safe'. They will be completing workshops with the children in Y5 and Y6 next week. The children enjoyed a very tuneful film night, arranged by the PTFA. We even had time for a cool down interval half way through. Success at the Rolls Royce Engineering Challenge. Our budding Engineers had been working on their car projects with Miss Challender all term. Amelia and Lucy - Car that travelled the furthest and highest up a ramp. Brilliant effort, well done everyone. The netball team is also busy competing in inter-school matches currently. Well done for their commitment and enthusiasm. Great team work and effort. Well done. Sunscreen, sun hats and water bottles will be needed this week. Sun glasses are also useful especially to children with hay fever. The garden is coming on a treat! 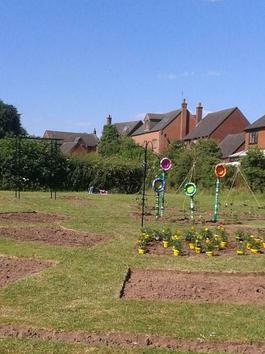 The end of a very busy week digging and making as part of our Community Garden project. The children are creating ornaments, living wigwams, colourful flowers and even a bug mansion and that's just to mention some of the creative ideas being produced to make our Community Garden an interesting and relaxing space to enjoy nature and just 'day dream'. A huge thank you to the parents and friends of PJS for helping with the heavy work, we couldn't have done this without you. We hope to have a grand opening in the next few weeks once we have the area planted up. The World Cup has started and the classes are watching how their team is doing. The sun is shining and the SATs are over. I would like to congratulate the Year 6 children on their calm and sensible approach to this week. They have all worked incredibly hard and demonstrated such mature attitudes to their learning. They have really earned their end of SATs party. Well done everyone! WORLD CUP DAY - The school is looking very colourful with every class now supporting one of the world cup teams. Year 4 and Year 5 having an incredible workshop playing the steel drums. 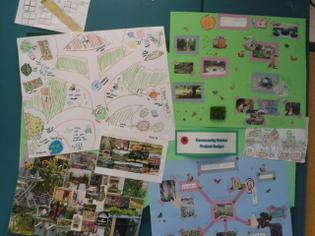 Next week will be our Community Garden Project week.